Safe, relaxing and completely natural vision training technique. Takes only minutes a day. *One size fits all sizes. 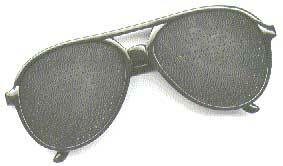 *The pinholes are approximately 1/32 " diameter on regular & laser styles. NOTE: The only difference between the Original and the Laser Style is the color of the frames. 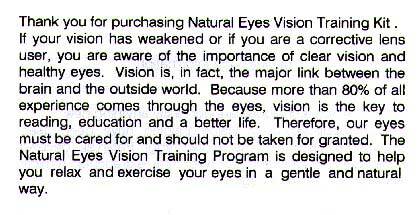 From the booklet that is included with every pair of Pinhole Glasses. The child's version of the pinhole spectacles are the same as the adult version but with smaller frames. Child's size measures 5 3/8" from temple to temple. *Find out the real eye health and healing secrets passed down from the master teachers. 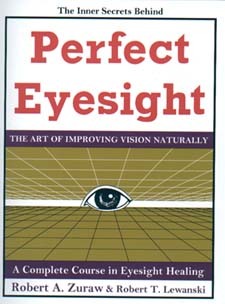 *Find out how you can attain Perfect Eyesight without glasses or surgery! *Perfect Eyesight contains the latest and most important vision improvement discoveries of the decade! *The Zuraw Personal Eyesight Training System stems from 39 years of research and testing. Nutrition, herbs and super foods for clear vision....and more!!! This book is probably worth the cost of a $150.00 weekend course. It contains a wealth of information, and can be used in conjunction with the pinhole glasses to improve your vision naturally.